There are devices to greatly ease zippering a zipper with a hole in the zipper pull tab. But some "high fashion" dresses and gowns have a tiny smooth solid zipper pull tab without a hole. I have yet to find a device that really works well with these. I have one device with a clamp and long handle, but it is very difficult to use, and it's unreliable (slips off the smooth pull tab most tries). I wonder if any of your readers has found a reliable "zipper helper" for those smooth, solid zipper pull tabs. Like all the best ideas nice and simple, on a number of occassions I have had trouble, worst is when trying on a dress at the shop, getting it o OK but then not being able to undo the zip! 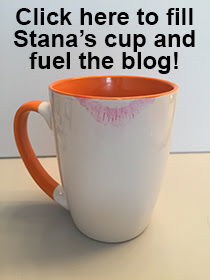 Hi Stana, I love your blog. Check out suddenlee.com. Since you live in the northeastern US, check them out. They are perfect for femulators not comfortable shopping at a mall. Basically, using their site you can shop at the local mall and they will pick it up for you and ship it to you, saving you the trouble of actually visiting the mall. Just a thought! Stana, absolutely loved your post about zipper pulls! I've worn dresses that zip in back forever because that's what was available. Living alone made it tough, thanks for such a simple zipper tool! Hello, I am the Independent Woman who invented the ZipHer, the zip-up solution sold on www.PrimaProductions.com Now newly released (by popular demand) is an extra-sturdy ZipHer! It is 6 inches longer and has a heavier ball chain for those taller or stronger customers. Go to the Order pull-down menu on PrimaProductions.com and order Extra Long ZipHer. It was designed by a 6'2" engineer who sewed a zipper in the back of his flannel shirt to test it!